Delegates at the UN Conference on climate change last December faced a painful choice. They could specifically mention the necessity of reducing greenhouse gas emissions by 25-40 percent by 2020 and face the possibility of a U.S. walkout from the negotiations. Or they could drop all mention of targets to keep Washington in the negotiations. 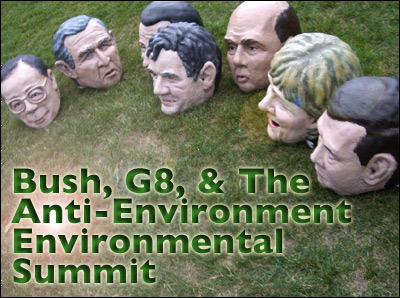 The delegates went with the latter to appease Bush. But now after the G8 summit in Hokkaido, Japan, it is clear that the delegates made a strategic mistake. The G8's endorsement of a 50 percent reduction in emissions by 2050, which they have presented as a major step forward, is actually, as the South African government put it, a "regression from what is required to make a meaningful contribution to meeting the challenges of climate change." "The planet is burning while the G8 is fiddling"
The idea of the "Anthropocene" -- an Earth epoch defined by the emergence of urban-industrial society as a geological force -- has been long debated, but last August, the world's oldest association of Earth scientists, unanimously agreed it has come to pass. 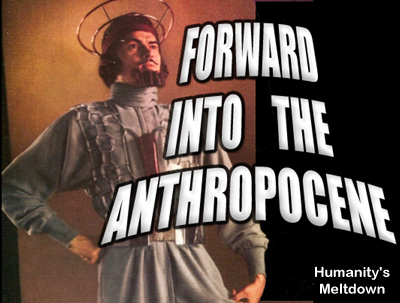 This new age, they explain, is defined both by the heating trend (whose closest analogue may be the catastrophe known as the Paleocene Eocene Thermal Maximum, 56 million years ago) and by the radical instability expected of future environments. Evolution itself, in other words, has been forced into a new trajectory. This coincides with growing scientific controversy over the most recent report from the Intergovernmental Panel on Climate Change (IPCC) which has, in effect, bet the ranch, or rather the planet, on unplanned, market-driven progress toward a post-carbon world economy, a transition that implicitly requires wealth generated from higher energy prices ultimately finding its way to new technologies and renewable energy. "I thought, 'Nobody in the U.S. has any idea what it means when they hear that 20 people died in a suicide bombing'"
Phyllis Schlafly: "The alternative is so bad we must support John McCain"
In the 1960s, a subculture of Americans became obsessed with alien abductions.The aliens were unintelligible, likely harbored designs for taking over the world, and seemed to hover just beyond our line of sight waiting for an opportunity to put us to some unknown use. For roughly 20 years, the case of North Korean abductions seemed to exercise a similar hold on the Japanese imagination. The stories of missing Japanese rumored to have been abducted by North Korean agents belonged to the margins of political and media discourse. No mainstream media outlet would touch the story. But in 2002, the abduction narrative in Japan swerved suddenly from the margins to the very center of the policy debate. Japanese Prime Minister Koizumi Junichiro visited Pyongyang on September 17, 2002 in an attempt to break the logjam of non-recognition in Japan-North Korea relations. In the course of that visit, Koizumi extracted a confession and an apology from North Korean leader Kim Jong Il. North Korea had abducted Japanese citizens. 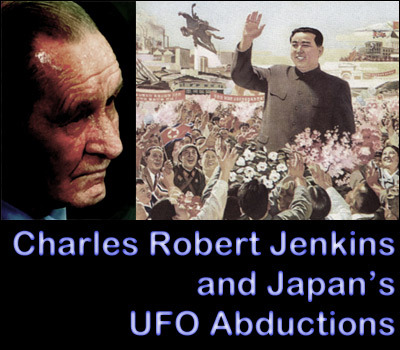 It was as if a UFO had landed in downtown Tokyo and the earth stood still for the Japanese. A narrative nurtured by a relatively small group of Japanese, particularly the families of the disappeared, had turned out to be true. "Within a generation this city would cease to exist"
Human rights have deteriorated, not improved in the run up to the Olympics. How About 'Tough Love' for Bankers? 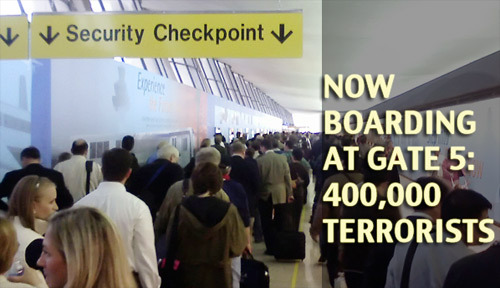 In a recent op-ed in the Washington Post, Leonard Boyle, the director of the Terrorist Screening Center, defended the watch list, claiming that because terrorists have multiple aliases, the names on the list boiled down to only about 400,000 actual people. If there are 400,000 terrorists lying in wait to attack the United States, we are all in trouble. But wait a minute. There has been no major terrorist attack on U.S. soil since 9/11 -- almost seven years ago. Where are all these nefarious evildoers?